I am running Ubuntu in VirtualBox (on a Windows 7 host). Several times now, the top-level menu bar, the task bar — and seemingly every system dialog — have forgotten the out-of-the-box "Ambiance" theme they conform to when I first installed the system. Window captions still preserve the theme, but pretty much nothing else does. I have searched high and low on Google for assistance with this problem. 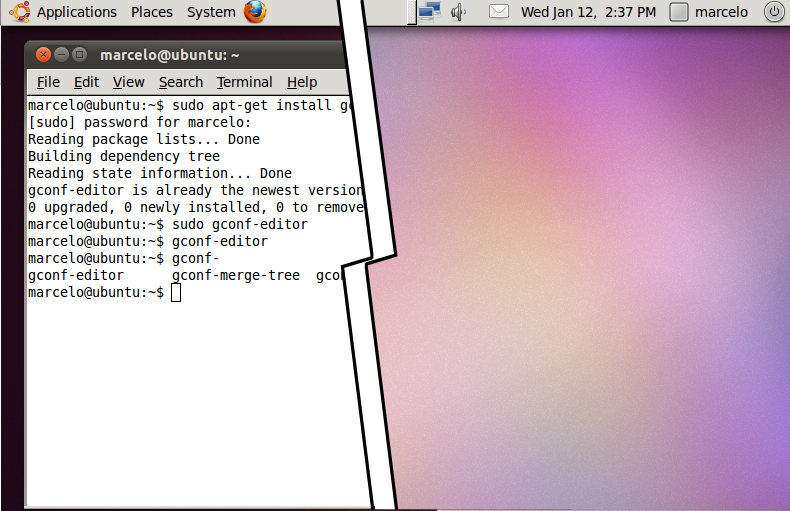 Everything I've found suggests either running some gconf reset or deleting .gconf* .gnome* and other similar directories. I have followed all this advice and nothing works. I still get a boring Windows-95-style gray 3D look and feel. On previous occasions, after much messing around I've given up and rebooted the VM instance, and been pleasantly suprised to see the original "Ambience" theme restored throughout the UI, but invariably it disappears again some time later, usually after a reboot, so I can never figure out what I did that broke it. Here's a sample from Ubuntu's site of what I want it to look like. And here's a screenshot of my system as it currently looks. Also note that my GNOME Terminals normally have a nice purple semi-translucent look, and as can be seen from the screenshot, they are now just a solid matte white. How do I recover the out-of-the-box theme for my Gnome/Ubuntu desktop, noting that blowing away all config files — as suggested in many places online — fails to achieve this? It might help to know that it seems to fail either after I resize the VM instance, forcing the Ubuntu desktop to resize itself, or after I play around with Compiz settings. I haven't been able to figure out which of these it is, and it could be neither. Given the amount of pain I have had to go through to get things back to normal (and given that I am at a loss as to how to do so), it has proven difficult to definitively isolate the cause. @zpletan's answer lead to a bit of hunting around, which quickly unearthed what seems to be the root cause of my problem. It's detailed in Ubuntu Bug #574296. In summary, my Core i7 system with an SSD starts everything with sufficiently different timings that gnome-settings-daemon runs too early, bails, and leaves me mostly with a stock GTK theme. Exec= bash -c "sleep 2; /usr/lib/gnome-settings-daemon/gnome-settings-daemon"
I couldn't fix this problem with any of the suggested answers (the currently accepted answer worked sporadically, but usually did not work for me). I tried increasing the sleep time by a lot and it still wasn't working consistently. However, one of the answers did point to a bug that tracks this issue, and I found a comment on the bug that solved it for me. Make sure it is executable (run chmod +x). That seems to have fixed it so far for me. 10.10 has this problem, but normally it happens when you install the proprietary nvidia driver. However, the solution will probably also work on a virtual machine. and save it in your home folder under the name .gtkrc-2.0. Restart. If there are still elements wrong (for me it was the font), you need to add this change to the file, google for a gtk tutorial for the possible fine tunings. I have been looking for a fix for this issue for months. Apparently no one knows what causes it. This bug has existed for years and no one has fixed it. Sometimes it happens during boot with a race condition between the first and second instances of gnome-settings-daemon, and sometimes it happens in the middle of a working desktop session when gnome-settings-daemon either stops functioning or crashes. in a running terminal that I leave open. Closing the terminal kills the background instance of gnome-settings-daemon and the desktop reverts to the default theme (not Ubuntu default but gnome default). Therefore I run the daemon it in the background and leave the terminal running too because the process needs its parent. I had the same problem and I was getting an error in the begging: Could not apply the stored configuration for monitors. Removed the file: ~/.config/monitors.xml re-logged and worked like a glove. Sorry but my previous suggestion of using '--sync' isn't a fix. Turns out after some restarts the problem is the same. ** (gnome-settings-daemon:1679): WARNING **: Unable to start xsettings manager: Could not initialize xsettings manager. When the theme is successfully applied, there is no output. From this, looks like gnome-settings-daemon might be running two times somehow. Apparently, if the first instance completes before the second instance is run the theme will be applied else it will fail. PS: Further tests, show that there is indeed two instance running which should run one after another. Every thing's done. Basically, what we are doing is waiting for the first instance to exit before the second one is launched. Could anyone notify if this fixed their problem? I had the very similar problem too. This was after a (IIRC partial) upgrade of my Natty Narwhal as it was on alpha 3 state. In my case, the ~/michael/.nautilus/browser.xml file seemed to be corrupted. After trying out some of the suggestions of this partial site I simply deleted this file, restarted my pc and all my themes were back and remained stable. I think, you can try to solve your problem like me. This happens to me occasionally with 11.04 Unity 3D and each time I cleared it by opening Appearance, Customize button, Icon tab and clicking on my chosen Icon set even though it was indicated as in use. In my case that would be Faenza-Dark. It happens so infrequently that I've yet to identify any sequence of events that causes this. This happened to me as well and in my case, I had to nuke my entire home directory and then restore bits and pieces back in, per the answer here. If you are doing the timing scripts for gnome-settings-daemon, see if you can make it work properly by creating another account and logging in as that account. In my case, the 2nd account didn't have the non-start issue, and hence, I applied the fix in the link. I think there are quite a few people with the right idea. My guess is that after certain updates (new kernels, etc) that ureadahead gets reprofiled. This is where I think the problem happens. gnome-settings-daemon gets called too soon. I deleted all the files with 'pack' (pack, home.pack, boot.pack, run.pack) in the name in /var/lib/ureadahead/ folder to force a reprofile. Everything looked great after that. When reprofiling, delete above files, reboot, and log in quickly as soon as you see the login screen. Wait about 30 seconds, or when the drive stops spinning before doing anything. Let it finish its business. Your nautilus window should look okay now. Maybe a bug should be filed with ureadahead for putting gnome-settings-daemon out of order. Not the answer you're looking for? Browse other questions tagged gnome themes gnome-settings-daemon or ask your own question. Why is Ubuntu sometimes ugly when I log in? Is there a good Ambience theme for Xubuntu (XFCE, XFWM)? Why is my Unity theme going haywire? Why can't I change my icon theme in gnome-classic?